“A knight is made neither by King nor all the chivalry assembled; their part is but to recognize that he has made himself a knight. Neither belt, spurs, nor chain makes up a knight, nor yet the accolade of any King.” – An article from Cariadoc’s Miscellany. The Miscellany is Copyright (c) by David Friedman and Elizabeth Cook, 1988, 1990, 1992. Sunday afternoons fighting starts at 3 pm, goes as late as nightfall – Audubon Park (at the corner of Goodlett and Southern). SCA fighting – What is it? For those who love competition, history, and challenge, the SCA fighting forms represent very flexible, durable and exciting activities that serve a wide variety of purposes. Originally based upon the experiments into medieval fighting done as a result of Diana Paxton’s famous party, the SCA form has developed into a real martial art that can be experienced on a variety of levels. The Medieval analogies for the SCA style of fighting can be found in a variety of places. The SCA itself is very tolerant of divergent cultures and aspects of the very loosely defined ‘Middle Ages’, and combat is being developed as a matter of reaction and experimentation. For all of this, it is remarkably like some of the historical precedents, most notably the béhourd or the 14th and 15th century pas d’armes. In terms of the béhourd, the similarities are striking. Although medieval terms for the tournament seem to be imprecise, it is clear that the béhourd was a combat à plaisance, done for the pleasure of the combat and for the pleasure of the ladies. Béhourds were fought with weapons of wood or ash, the armour in at least one case of cuirboille, or boiled leather. These combats were still used to demonstrate the prowess of the combatants, but their intent was not to injure or slay; much like the tournaments today. 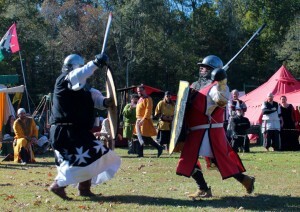 The tournaments and joi de combat of the SCA form is no different. We too look both to our ancestors, the knights of medieval Europe, and to the romantic ideals to provide us with the guides we use in our behavior. Like these knights of the Middle Ages, we seek to improve our lot by using these knightly tests and displays of virtue. And to a degree, the SCA succeeds in this quest. Like the béhourd, the SCA uses wooden weapons made of rattan instead of their more dangerous steel counterparts. Though the weapons are of wood, the fighting is a full contact, full speed, hard pressed competition between two powerful combatants. Combatants face one another armed in armour of steel, cloth, or leather, some home-made some produced by fine craftsmen coming close to the quality and line of the medieval models. They fight with speed, elegance, and power, their techniques different according their local region and their own individual style. Their weapons, covered with silver duct tape (as Edward I had weapons silver-leafed for his famous Windsor tournament of 1278), weigh between 2 ½ and 3 pounds, each capable of leaving their mark on the unwary defender. The combat itself is regulated by a set of rules built by trial of thirty years time, mostly built on safety considerations so that the combatants can meet and fight to the best of their ability with a record of safety superior to football. With more than 10,000 combatants recorded, no one has been killed. The last two paragraphs describe what I consider the form of SCA fighting. It is a form that allows for a number of styles within that form, each style possessing advantages and weaknesses. Some styles are completely authentic, while others are a natural evolution based on the rules that govern the combat. Most often you will find combatants fighting with a sword and shield, but you will also see single broadsword alone, axe or mace and shield, polearms, daggers, two broadswords, two-handed swords, spears and even (in some places) archery. The novice will also find bountiful support in terms of people willing to teach what they know. Most often training is taken on an individual basis, combatants being very eager to share what they know. In a few places, training is more formalized into classes, but this is still relatively rare. As the novice progresses, they might choose to build a formal bond with a single knight, or another trainer, who will take their development as their own responsibility, helping the intermediate combatant along towards the day when they too are experienced veterans.